This is something that doesn’t come around often! 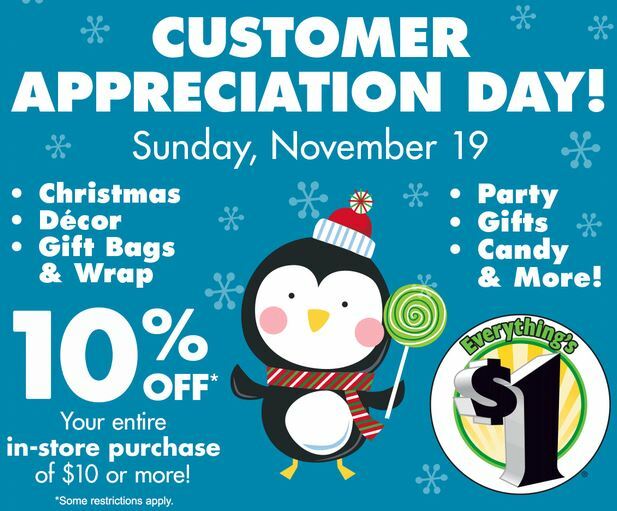 Print this coupon, then stop by your favorite Dollar Tree store for 10% off your entire purchase of $10 or more on Sunday, November 19, 2017, ONLY! This would be a great time to stock up on wrapping paper, bows, tape, stocking stuffers and extra batteries for new toys! Offer valid only on Sunday, November 19, 2017. Void if copied, transferred, or duplicated in any way. Voucher is not redeemable for cash, is non-transferable, and cannot be used in conjunction with any other voucher, coupon, or discount. Not valid on previous purchases, gift cards, Green Dot® pre-paid cards or reloads, or DollarTree.com orders.